Circa 2010, Jean-Marc and Gillian with a random wedding guest. Most often when you see a guy and a girl in a photography business together, it is assumed that they are a couple. We are married, but not to each other! This fact then leads most people to ask, how did we start this business together? It is a story that begins about 12 years ago, in October of 2006. I (Jean-Marc) was a hobby photographer, working on a Masters in aerospace engineering. Gillian was already shooting for a high end wedding photography company in Toronto. One fine fall day I was a groomsman in a wedding at which Gillian and the owner of that company were the photographers. My friend Jay was chatting to them (I think he kind of liked Gillian or the other digital assistant that was there), and found out they were in need of assistants. He knew that I was really into photography and suggested I apply, which I did, and ended up working there alongside Gillian for the next 10 years. Fast forward to 2015, both Gillian and I were lead shooters for that company, managing our own team of shooters at up to 34 weddings per year. I had quit my life in engineering to pursue photography, and was dabbling in corporate and commercial assisting and learning all I could from my mentors in Toronto, alongside my wedding photography work. Gillian and her husband were ready for a change, and wanted to move to Alberta where her husband’s family were, as well as for a quieter lifestyle in the country. Then by chance my wife was scheduled for a residency in Calgary, so we were moving out here, and when Gillian found out it was the kick in the pants she and her husband needed to make the move! We decided to start a company together, and the planning began. First we needed a name! 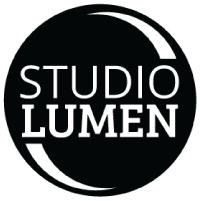 There were many brainstorming sessions with our spouses and lots of wine and beer, and we were almost there with Lumen Studio, but it didn’t sound quite right. My mother-in-law, who worked in media for many years, flipped it around to Studio Lumen, and it was just the switch it needed to make it stick! For those that don’t know (don't feel bad if you don't, it is weird knowledge), a lumen is a unit of luminous flux, or more simply, the amount of light from a light source passing through a space. We think it sounds cool, it’s appropriate for our business, and is a nod to the work I had done in light pollution in my past life as an engineer. The type of work we were going to do also changed. Weddings are a very seasonal business, and we wanted to stabilize that somehow. I had learned a whole lot from my corporate photography mentor in Toronto, Matthew Plexman, and knew that that was what I wanted to do. At first Gillian was a bit skeptical of the work we might be doing, but once we realized that you can build great relationships with commercial clients (in some ways better than wedding photography clients), and that the type of jobs is more varied and interesting than we’d at first thought, we were both excited to jump in. By chance, and after much humming and haw-ing (film is Gillian's hobby and passion, and was a bit worried it might lose its appeal), we made a documentary style commercial video for one of our first and favourite clients, a process which we both ended up really loving, and which actually suited Gillian's passion for film-making, and that was added to our service offerings. So that, in a nutshell is how we got to where we are now! There are so many more steps and things along the way – for example, our time at ATBx, how wedding photography is so adaptable to corporate and commercial work – but I will leave those for another post.